Namdeb launched the Zaamwani Surveyor, a purpose built vessel that was acquired to survey the bathymetry of the nearshore portions of the Namdeb mining license areas. The vessel is used by the Survey Section in the Mineral Resource Department and is expected to provide better information with regards to imaging of the seabed and sub bottom characteristics. 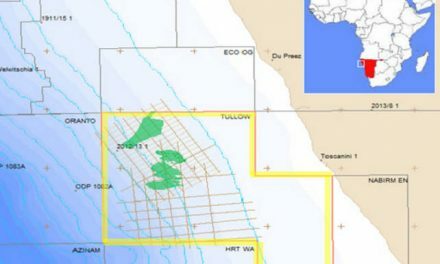 These are important first steps in the exploration process of the shallow marine mining licence areas. The N$1.5 million dollar vessel got its name through an in-house competition whereby an employee from the Mineral Resource Department made the suggestion. 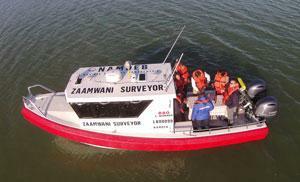 The Zaamwani Surveyor was primarily built for the acquisition of high resolution data using multi-beam echo-sounder (MBES) technology, however its generic design can accommodate other geophysical sensors, serving as a multiple purpose vessel. Nel added that the multi-beam echo-sounder pole, to which the sensor is mounted, is deployed over the stern (back) as opposed to over the bow (front) on the previous platform. “This has numerous benefits, most importantly the unimpeded vessel manoeuvrability and reduced motion of the sonar, which leads increased accuracy of the data,” said Nel. The vessel has an enclosed cabin which protects the team and equipment on board from nature’s elements during long hours at sea. With an established and well proven hull design that is perfectly suited for launching through the surf zone, the vessel is also equipped with outboard engines that are easier to maintain, with specialist support available in Namibia. The Zaamwani Surveyor replaces the Jetboat which was the initial platform developed for this purpose and has already completed three commissioning surveys since the beginning of the year.